The original Special Stage from Sonic the Hedgehog. Special Stages are a staple type of level in the Sonic the Hedgehog series, whose primary function is to offer the player an opportunity to earn one of either the Chaos Emeralds or their analogues (see below); and, even if unsuccessful at that, a bonus to their score. Special stages vary among games in design, means of access, and the prize. In Sonic 3 & Knuckles, if all Chaos Emeralds have been collected, the aim is to obtain a Super Emerald; in Sonic the Hedgehog CD, a Time Stone; or, in Knuckles' Chaotix, a Chaos Ring. In Fleetway's Sonic the Comic, the Special Zone is a type of alternate reality similar to Special Stages. Some regions have strange physics compared to Mobius, while others contain fairly normal worlds. It is here that the Chaotix crew make their home, as well as Lord Sidewinder and various other villains. 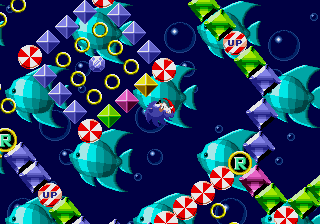 Super Sonic, who is unlocked by completing all Special Stages and collecting all Chaos Emeralds in Sonic the Hedgehog 2 and several later games, was at one point separated from the normal Sonic and trapped in the Special Zone by a Star Post, which are used to enter Special Stages in that game.